Miss Lemon wonders if her readers ever feel the same sense of privation that she sometimes feels after finishing a particularly good whodunit. 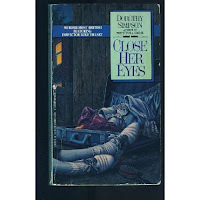 Such was the case when she turned the last page of Close Her Eyes, an especially absorbing mystery from the pen of Dorothy Simpson, first published in 1984. Although the murder was solved and all the fraying ends that emerged during the investigation neatly nipped, Miss Lemon hoped the story would continue. She enjoyed it that much. The work of Mrs. Simpson is new to Miss Lemon, who picked up this entry (number four in the series featuring Inspector Luke Thanet) at a second-hand bookshop only the week before last. And please let her say that the $1 given over for the purpose (yes, Miss Lemon confesses to occasionally purchasing books from the other side of the Atlantic) was worth every cent. Although editors, publishers, librarians and other such people who like to organize, classify and label literary works would probably call this novel a police procedural, Miss Lemon found herself particularly taken by the psychological explorations of victim, criminal and investigator. She suspects that if her readers like the work of Ruth Rendell, then they will also like that of Mrs. Simpson. In Close Her Eyes, the author elegantly illustrates that too often, man is the author of his own torment and unhappiness. The mystery here centers on the death of Charity Pritchard, the unlucky daughter to a martinet father and passive and ineffectual mother -- and all of the family members of a fanatical religious sect called The Children of Jerusalem. Needless to say, Inspector Thanet's investigations turn up behavior on almost every character's part that many would consider less than Christian. At the same time, the Inspector tries to exorcise a demon of his own. What Miss Lemon likes best about the Inspector's cerebral approach to crime solving is his careful analysis when it comes to questioning suspects and witnesses. He not only calculates how and what he'll ask before he asks it, but also tabulates the response or lackthereof with a facility and precision not seen in even his most luminescent literary forebears -- Mr. Sherlock Holmes and Monsieur Hercule Poirot included. Fortunately, Miss Lemon had the foresight to snap up two other works by Dorothy Simpson during her recent acquisitions spree. She'll be reading Last Seen Alive (1985) and Element of Doubt (1987) and reporting back to her readers shortly.